The last damaged used fuel assembly from units 1-3 of the Chernobyl nuclear power plant was removed yesterday - from the cooling pool of unit 1 - and transferred to ISF1, a wet-type interim storage facility. State Specialised Enterprise ChNPP, which is responsible for managing the Chernobyl site, noted the work had been completed after the State Inspectorate for Nuclear Regulation of Ukraine (SNRC) had permitted extension of the allotted time for the work beyond 14 April. Damaged fuel from unit 2 was completely removed by 23 April, it added. On 26 April 1986, the Chernobyl plant suffered the worst nuclear accident in history when a power runaway event wrecked reactor 4. The three remaining reactor units, however, were vital to Ukraine's electricity needs and continued to operate for some years. Unit 2 shut down in 1991, unit 1 in 1996 and unit 3 in 2000. The plant officially entered the decommissioning phase in April last year, following approval by the SNRC. The first phase of decommissioning is the so-called final shutdown and preservation stage, which is expected to take ten years. In a statement yesterday, SSE ChNPP said a “qualitatively new level of activity” could start at the plant as it enters the decommissioning stage. Unloading the last of the damaged fuel means the status of the two units has now changed and they are no longer classed as nuclear installations. Once regulatory approval has been received, their status will formally become radioactive waste management facility, as has happened already with unit 3, SSE ChNPP said. This new status will enable work to "speed up", it said, on dismantling equipment and the plant's decommissioning. Accelerating the pace of this work will help SSE ChNPP reduce operating costs and thus the "burden" on the Ukrainian budget, which is partly funding the work. On 25 April, one day before the 30th anniversary of the accident, the European Commission pledged to the Nuclear Safety Account fund the largest part of the €45 million ($51 million) donated by the G7 and the Commission in addition to existing support. This fund supports in particular the safe decommissioning of units 1 to 3 of the Chernobyl plant. The Nuclear Safety Account, managed by the London-headquartered European Bank for Reconstruction and Development, funds the construction of a storage facility for used nuclear fuel from the operation of the plant. The main project currently supported by the fund is the interim used fuel storage facility (ISF2). Its completion is foreseen for 2017. The facility will provide for the processing and storage of the used nuclear fuel from units 1, 2 and 3, which is required for the decommissioning of the plant. SSE ChNPP announced on 26 November last year that the first ten canisters for ISF2 had been delivered to the site. ISF2 was constructed under a contract Ukraine signed with US-based Holtec International in 2007. It will store all the used fuel on the site for at least 100 years. The 'double-walled' canisters are "at the heart of" the NUHOMS interim dry storage system to be used at ISF2 for the long-term interim storage of used nuclear fuel from the Chernobyl plant's RMBK-1000 reactors. The purpose of this system is to store the used fuel for the entire design service life of ISF2 in an inert gas environment. SSE ChNPP said yesterday that "significant delay" in commissioning ISF2 had led to the need to use ISF1 as the main storage area for used nuclear fuel from the plant. The EU's contribution was announced at the Nuclear Safety Account Pledging Conference that took place in Kiev to mark the 30th anniversary of the accident. This contribution is in addition to those already provided to the Chernobyl Shelter Fund for the construction of the New Safe Confinement (the Shelter) and to other related projects to isolate and ultimately dismantle the unit which suffered the accident. The Shelter, to be completed in 2017, will prevent radioactive releases and contribute to make the site environmentally safe and stable, which is also important to the countries directly bordering Ukraine. The EU is the main donor to this project with around €430 million. Removal of used nuclear fuel from the Chernobyl plant has been carried out in three stages, SSE ChNPP noted. Firstly, fuel was unloaded from unit 3 and transferred to ISF1. Secondly, all undamaged fuel from units 1 and 2 was removed and transferred to ISF1, while technology for the safe management of damaged nuclear fuel was developed. Thirdly, and completed yesterday, the damaged fuel was removed from units 1 and 2. All the fuel from unit 3 was removed in 2010 and in December 2012 it received the status of radioactive waste management facility. Work to transfer fuel from units 1 and 2 to the fifth compartment of ISF1 started in December 2011, following 'stress tests' that were required following the accident at the Fukushima Daiichi nuclear power plant in Japan of March that year. 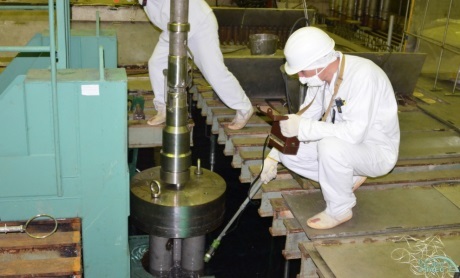 All undamaged used nuclear fuel from unit 2 was removed by 30 November 2012, while the transfer of undamaged fuel from unit 1 was started the following month. All undamaged fuel from unit 1 was removed by 28 September 2013.